Please do not link to this image, it won't work. SOMEDAY, YOU will stand before God. 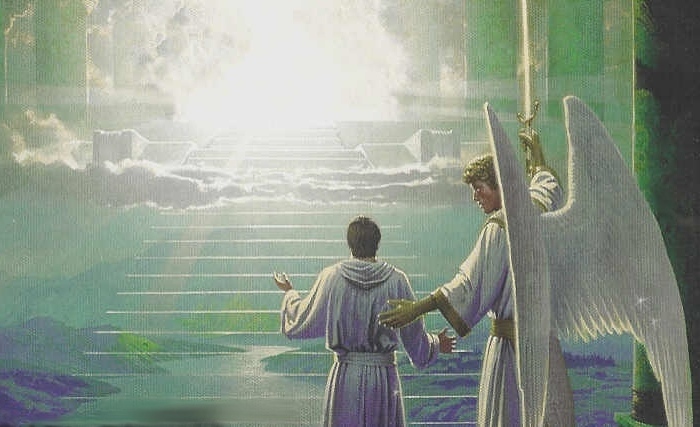 He will ask you, "Why should I let you into My Heaven?" Here is a 1 minute video that could CHANGE SOMEONE'S LIFE! MyMorningLight.org is not affiliated with their ministry. Please click (( Compassion International )) to find out more! A little nostalgia: Do you remember THE YULE LOG on TV? The version of this song being played on many stations now is not the same version. (A number of "copycat" artists have been re-making this wonderful song.) The original is sung with pathos* by the group Mercy Me. (It appeared on their 2001 album, "Almost There") It is this original version that we featured on Morning Light. "What does this song mean?" You may be asking... it is written from the perspective of someone who, during their life, has asked the LORD to forgive them of their sins, and invited Him to be the Lord of their life. (A "Born-Again" Christian.) The song depicts this person now standing before God's Throne, and rejoicing. Because the person depicted in the song was Saved from their sins, and had accepted Jesus Christ as their personal Lord and Savor, they now stand before Him to receive their Heavenly reward. ALL have sinned, there is NONE righteous, no not one. This is why God demonstrated His love for us, where His only begotten Son, Jesus Christ, died upon a cross. On the 3'rd day, He rose again. You can read about this incredible story in the BIBLE. Look for the "Gospel of John" in the New Testament. (It is the 4'th "book"- Matthew, Mark, Luke, JOHN.) There, you will read about the love of Jesus, and His offer of forgiveness. God's forgiveness is NOT AUTOMATIC, though! Each and every one of us must ASK for it! Believe in your heart that Jesus Christ *IS* the Son of God, that He died, and rose again, and that He is now at the right hand of God, making intercession for us! (The Bible describes Him as our advocate. Think: Lawyer.) Won't you ask the LORD to forgive you of your SIN? You don't have to recite memorized words... you woudn't speak to your Earthly Father that way... come to God with a sincere heart, and ask Him to forgive you. Ask Him to be the LORD (ruler) of your life, and to come into your heart. Read the Gospel of John in the Bible. Have YOU asked the LORD to forgive you of your SIN? I suggest tuning around the dial, and look for a Christian radio station. Listen to it for a while. You will learn many things about the Lord that you never realized! :) You can also call that station, and ask about a Bible-believing Church in your area. (Not ALL Churches teach the Bible correctly, so you need to make sure.) Here is a whole WEBsite, dedicated to helping you "find your way" so that you, too, can sing this wonderful song, and truly ENTER IN to the JOY of the LORD! I am amazed to see this page getting so many hits, even after all this time!